I really need to get my sewing room under control and I think the only way to do that is to finish things. In an effort to finish one project, I have been working with my leftover triangles again. I got them all sewed together into half square triangles units. Got all of those trimmed up and put them together into Broken Dishes blocks and then added them to all the blocks I have made in the past. 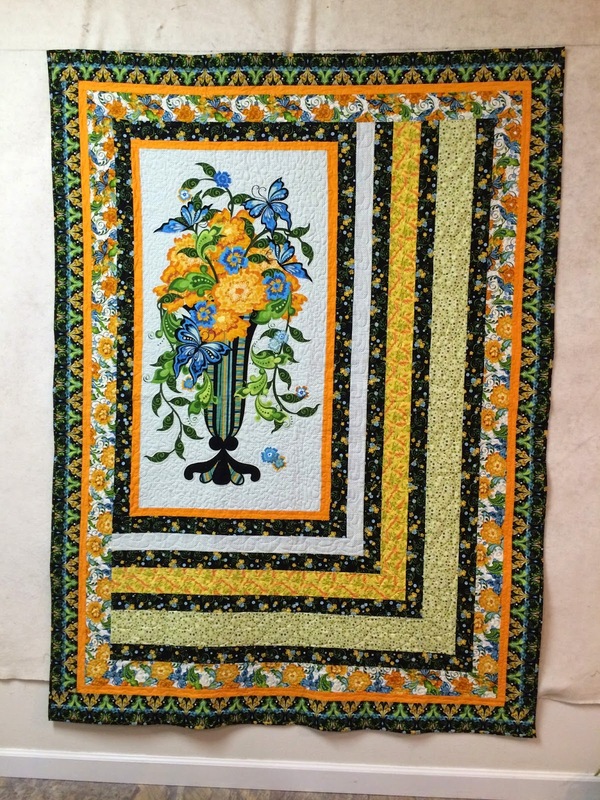 I saw a quilt somewhere online using rows of blocks of various sizes. It had either grey or tan as strips in between those rows. 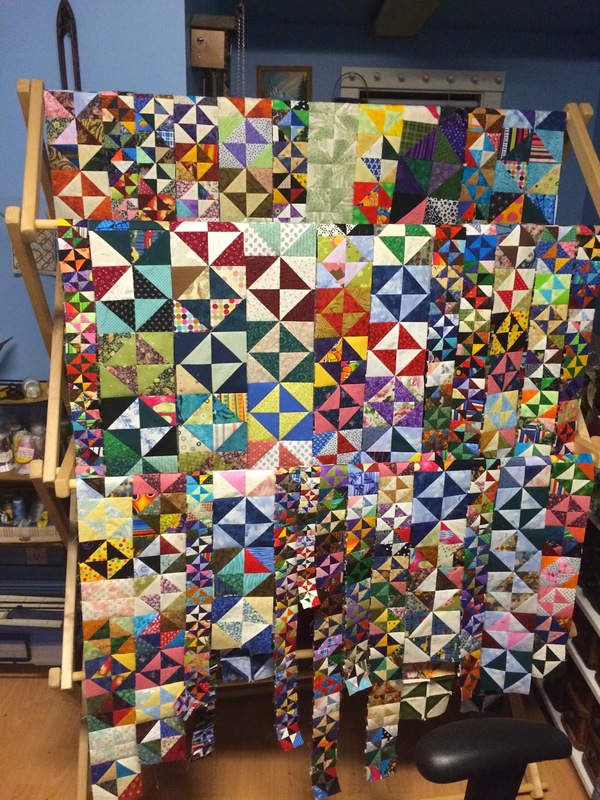 I counted all the blocks and figured out how big a quilt I could make and it was going to be pretty big so I adjusted and decided to make two smaller quilts, thinking they would be easier to sell or give away or something. 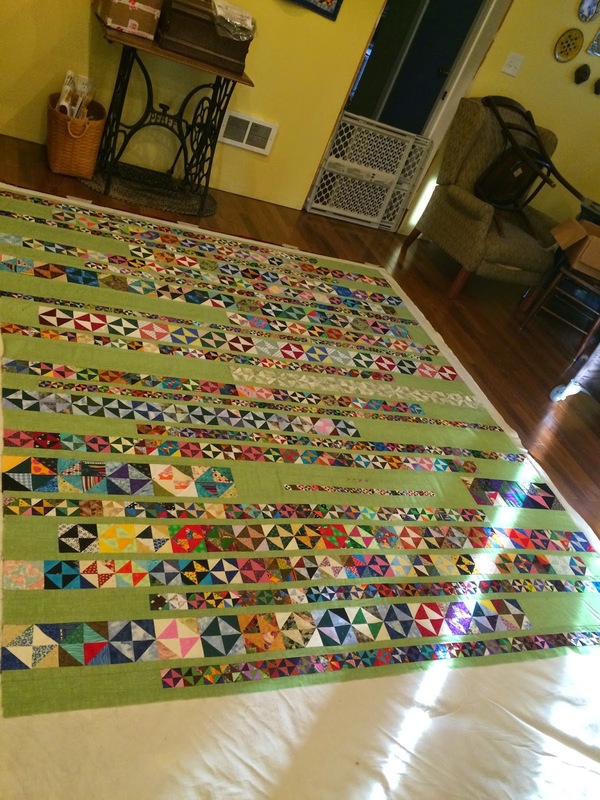 I sewed the blocks together by size into strips around 45-50" long and took them to work to lay out on the floor. As I laid them out I was talking to my boss about the upcoming Shrove Tuesday Pancake Dinner and Talent Show at the church and she mentioned having a silent auction also. I offered to add a quilt so I picked up what I started and took it all home to adjust the lengths of the strips to something more like 70-80". Here is a picture of the rows hanging on the drying rack after pressing. Here are the rows laid out at work. As you can see the rows varied a lot in length depending on how many blocks I had of each size. I took a few of the blocks to the fabric store to see what I could find for the 'in between' and my favorite was an apple green. 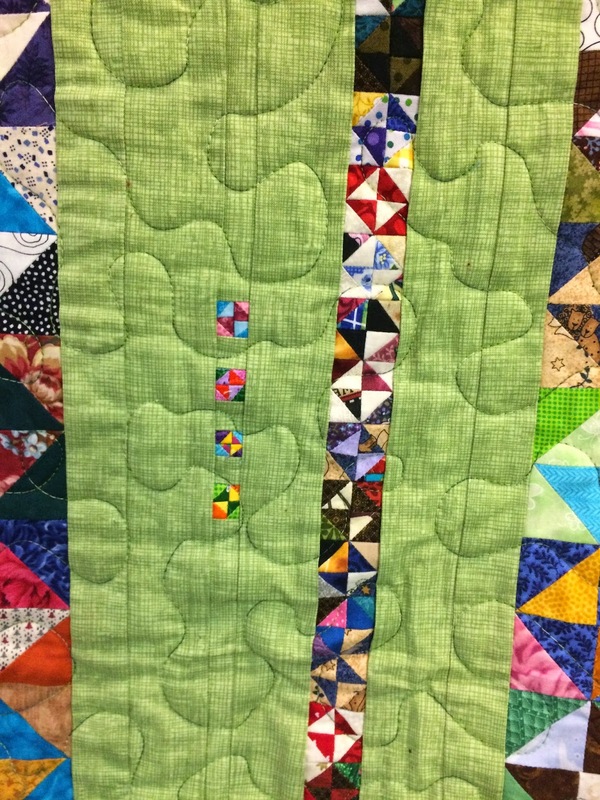 I added green to each row to make it 85" and then put 1" finished strips between the rows. Here is a picture of it on the floor for basting. I backed it with a barn red flannel - a king-size duvet cover that my husband got at a garage sale for $5 last summer. Here it is all finished and hanging at the church. I did a medium stipple using a variegated green thread. Here is a picture of the two smallest rows. There are 4 little 1/2" Broken Dishes blocks and then a strip of 25 - 1" blocks. 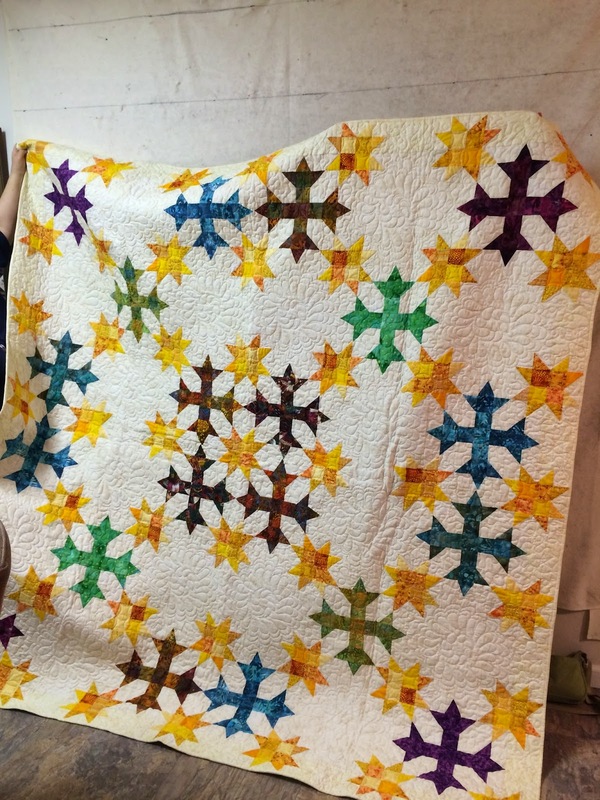 Tuesday was craft night next door and Sally had Linnea's quilt finished for us to see. Isn't that a cool panel? Linnea also brought her quilt from Mary from one of the previous exchanges. Mary hadn't been able to finish all the blocks and get it put together so we didn't get to see it at the reveal and then Linnea brought it one night to craft night but I wasn't there so I asked her to bring it so I could see it. It is quite beautiful in person! I finally finished my grandson's baby quilt. He is now 7 months old! It was made from blocks I cut out of the quilt I made for his mommy almost 30 years ago. 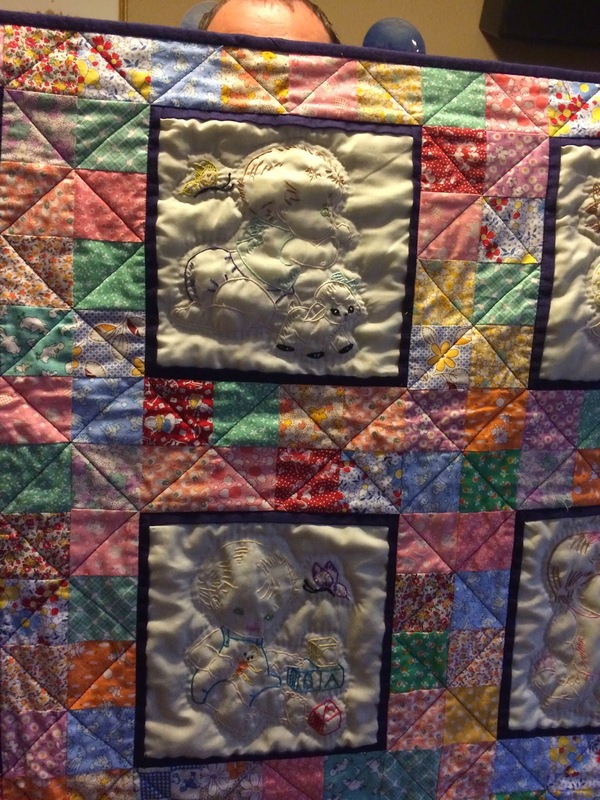 While pregnant I had embroidered the 12 old-fashioned babies on a piece of pale green fabric. When I had them done I just quilted around the embroidery and then between the babies. It was a pretty boring quilt though she loved it. 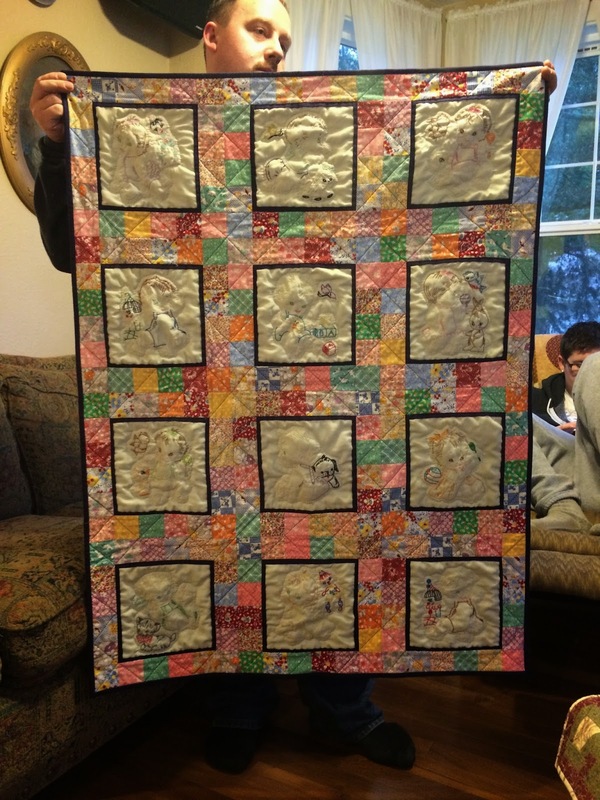 When we talked about a quilt for her little one I suggested redoing her quilt and she was open to that. She told me she likes the 30's prints so I got some and cut 2 1/2" squares to frame the blocks. When I cut the blocks I left the original hand quilting around the babies and just cut through all the layers and used them that way. I machine quilted diagonals through the small squares and added another round of hand quilting about 1/4" out from the original. The back I used was fabric I purchased in Sitka when I visited my daughter when she was in college and I thought it was appropriate since little Karl visited Sitka when he was just one month old. I have had everything done but the label a month ago but just didn't get to the label. Finally this week I wrote out a label and got it stitched to the back. I have pulled out my denim now and hope to work my way through that next. That would mean at least two large bins will be emptied and I should be able to get rid of some backs and batting that has been given to me too! I am hoping my next post will be an update on denim quilts. its very innovative creativity, i want to know that what material you sued to developed it. I have lost ads of old jeans and was wanting a cool pattern to make a quilt. I would love it if you could send me this one. Chimellebowes@gmail.com. I'm from Napanee Ontario n Canada. My husband past away in September. Just now able to donate/part/give away his things. Someone had suggested to make an memorial quilt. I have never quilted before. But I am willing to give it a shot. If you are still sharing the pattern, can I please have one? My e-mail is katabead@yahoo.com. thank you so much. What kind of thread do you use? batting?